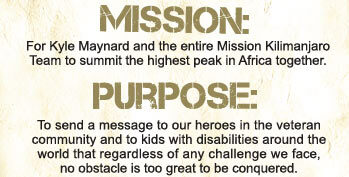 In bringing together both “able-bodied” and “disabled” civilians and military veterans on the climbing team, Mission Kilimanjaro’s purpose is to demonstrate to our heroes in the veteran community and to young people with disabilities around the world that no obstacle is too great to be conquered with an active, no-barriers lifestyle and mindset. Today’s veterans face adversity both on the battlefield and at home. Many return from deployment with scars that are sometimes invisible, making the transition back to civilian life challenging in unexpected ways. Tragically, an average of 18 veterans decides each day that those challenges are too overwhelming and choose to end their lives. Team Kilimanjaro is using the trek up the mountain to show these men and women who served so bravely that there are other choices and that it is possible to overcome any obstacle. Similarly, children born with disabilities face many adversities. Mission Kilimanjaro will begin in Moshi, Tanzania, with a trip to the Mwereni Integrated School for the Blind where Kyle and the team will spend time with children confronting the difficulties of living with a disability in a third-world country. The goal of this special interaction is to help inspire children to realize their ability to overcome any perceived limitation and transform their perspectives of what is possible in their lives. Through a donation from K2 Summit Productions, Team Kilimanjaro will deliver $25,000 worth of medical supplies to the school to help them to live an active, "no barriers" lifestyle and positively impact their local communities. The mission will culminate with the team’s summiting of Mt. Kilimanjaro over the course of 16 grueling days. With the summit, Kyle Maynard will become the first quadruple amputee to crawl up the fourth highest peak of the Seven Summits without assistance. Mission Kilimanjaro Co-Creator, Team co-leader, and spokesperson Kyle Maynard was born with a condition known as congenital amputation with arms ending above the elbows and legs ending near the knees. Facing the challenges he was dealt at birth, Kyle became internationally recognized as a wrestler, mixed martial artist, motivational speaker, and bestselling author of the autobiography, No Excuses. Despite his accomplishments, climbing to the 19,341-ft. summit of Mount Kilimanjaro will be his toughest test yet. Joining Kyle will be Sandra Ambotaite and Chris Hadsall, an Army staff sergeant and former Marine officer, respectively, who deployed to c ombat zones and bear both seen and unseen scars from their combat tours. 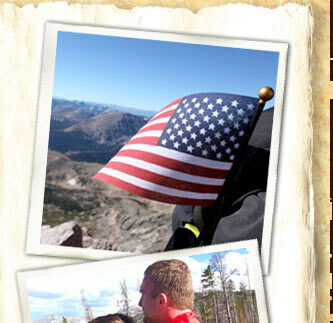 Each has defied his or her own adversity by choosing to push through barriers rather than giving up, and each is ready to share that experience with fellow veterans. Kevin Cherilla of K2 Summit Productions will serve as the expedition guide on the mountain. Kevin has a tremendous amount of experience in working with adaptive climbers, including a world record summit of having led eight blind climbers to the top of Mount Kilimanjaro. With 11 Kilimanjaro summits to his credit, Kevin’s expertise and knowledge of the mountain will guide the team every step of the way. Dan Adams, Mission Kilimanjaro Co-Creator, Team co-leader, director of strategic partnerships and former collegiate linebacker, who broke an NCAA record and led the nation in unassisted tackles in 2005 despite being considered undersized at 5’9”, 195 lbs. 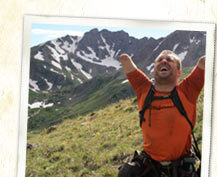 The support of sponsoring nonprofit No Barriers USA (www.NoBarriersUSA.org) and its chairman, Erik Weihenmayer, is a key element of the team’s success. Are you ready to overcome your barriers in reaching your highest potential? The climb starts January 4th, 2012.